It’s been all about charting these last couple of weeks. I have been drawing and sampling those Paisley shapes that I mentioned in my last post. It hasn’t been as straightforward as most things that I chart as Paisley patterns are all about curves. It is helpful that I will be using very fine thread. I have found that the finer the thread and the higher the number of ends, the closer I can get to creating patterns that look less angular and more curvy in warp-faced double weave. 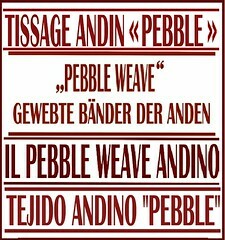 I love double weave so much I have made it the topic of my next instructional dvd. In the piece above, I had originally wanted all the lines to be curvy but simply couldn’t get the thicker outlines to look good in the 20/2 cotton. So, I settled on heavy, hard angular lines enclosing fine curves and was really happy with the result. But, it took a lot of time with paper and pencil and several woven test pieces to get there. Warp-faced double weave is so versatile. I can create hard angular designs with varying degrees of diagonals as well as softer more curvaceous ones. This was my very first experiment with curves many years ago. I wove this sample in a #10 crochet cotton and I know that it will look much nicer in finer thread. It is calling out to me to be woven. I guess the only limitation on freedom of patterning in warp-faced double weave is the fact that it is not ideal to leave large areas of open space. In open spaces the two layers of the double weave do not connect and that can sometimes lead to a sort of ballooning effect between motifs. I don’t think I will have any problem with open space in my Paisley pattern. They are such dazzlingly busy designs! In my last post I showed you the warp that I had wound for a 60/2 silk wrist cuff. It was a sample for a larger scarf project that I had in mind in warp-faced double weave decorated with the Paisely motifs that I have been charting. I finished the cuff and it gave me the measurements I needed to plan the wider project. I am particularly happy with the way the border turned out with the three tones of blue. I wanted it to have a washed-out uneven-indigo-dye look. It was hard to tell if that would work or if it would just end up looking like stripes. The two ends of the band overlap and I used clear plastic snaps to secure them. I placed a button at the overlap purely for decoration. I like wearing it with the wool ñawi awapa tubular band that I wove as a necklace some time ago. I prefer wearing that as a tripled bracelet and the colors match the new silk cuff nicely. The sample taught me two things about my scarf project….warp-faced double weave fabric, even in fine thread like 60/2 silk, does not have enough drape to make a nice scarf. The other thing, that was more reinforced than learned, was that the density of the warp-faced double weave structure creates more abrasion than usual on the threads on my backstrap loom. Some of the colors I used were doubled strands of 120/2 silk and I simply could not see those threads standing up to the abrasion of double weave along the length of a scarf project, even if they were doubled. So, I have gone another way with the scarf project. First, I will weave a shorter, simpler piece in the 60/2 silk with my double weave Paisley motifs. 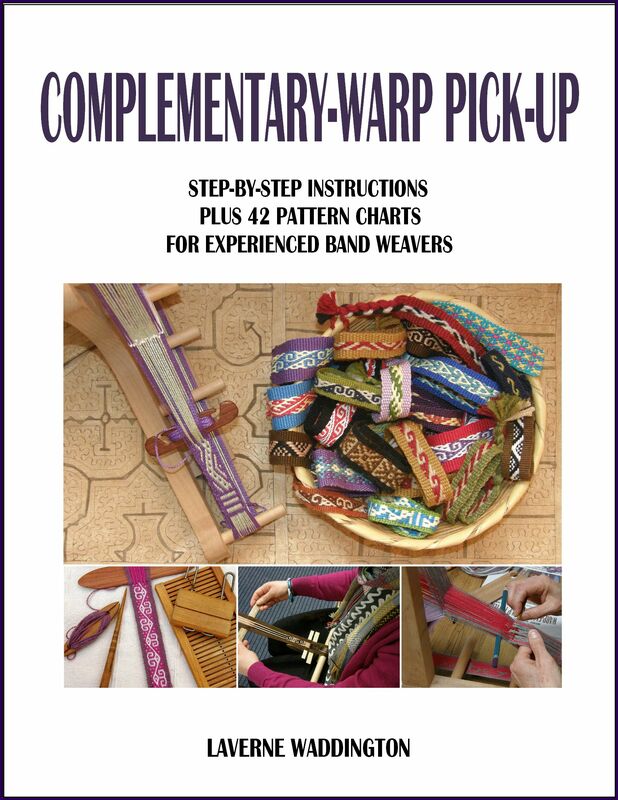 Then, I will adapt the Paisley charts to a supplementary weft technique for a plain-weave silk scarf. Paisley is such a busy kind of pattern….lots of swirls and spots and circles and dots…that I am sure that I will be able to break up excessively long weft floats with added design elements. In fact, I got quite overwhelmed looking at the busy patterns online. Some of them were so over-the-top! I struggled with the lack of symmetry and the lack of repeats but I was finally able to lay out something that I liked. And, I have managed to make it repeat. I wound and set up the scarf warp. I am still loving the way those blues look together! However, I will put this warp aside until I have thoroughly sampled the motifs in double weave. I have made it a circular warp so that it will fit in my bedroom. I am so used to weaving from end to end that circular warps always feel strange to me at first. I could have used an end-to-end warp and then simply rolled up the excess warp at the far end of the loom so that it would fit in my weaving space as I often done in the past. You can see my long yellow scarf warp rolled up below. Sometimes all the unwoven warp that lies under the top layer on which I am working feels like it is getting in my way especially when the warp is wider. That’s why I was very interested when watching a video of a backstrap weaver in India who is using a circular warp. I could see what she does with all the unwoven warp below her work space. Here’s a screen shot from the video. She has tied off the lower layer and has what I am guessing is a weighted bag dangling from it. That is the first time I have seen that. I am not sure if I will try it…we will see. Band weavers in Salasaca, Ecuador set up their circular warps in a triangular shape. These allow long pieces to occupy even less room and keeps the unwoven warp well out of the way. You can see how my teacher Felipe, below, can fit his long warp on his narrow porch. Before I go, I’d like to tell you about some interesting web pages that I have been looking at lately. The Kindcraft Brief describes itself as being for people who care about how things are made. Subscribe and you will receive a twice-monthly newsletter with articles on such topics as Indigo-dyed Washi Paper, the process behind Miao pleated skirts and the Handmade Textiles of Bangladesh. 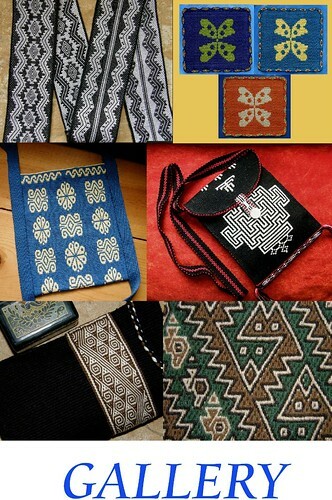 Asian Textile Studies: Asian Textile Studies is a new website written by David and Sue Richardson. 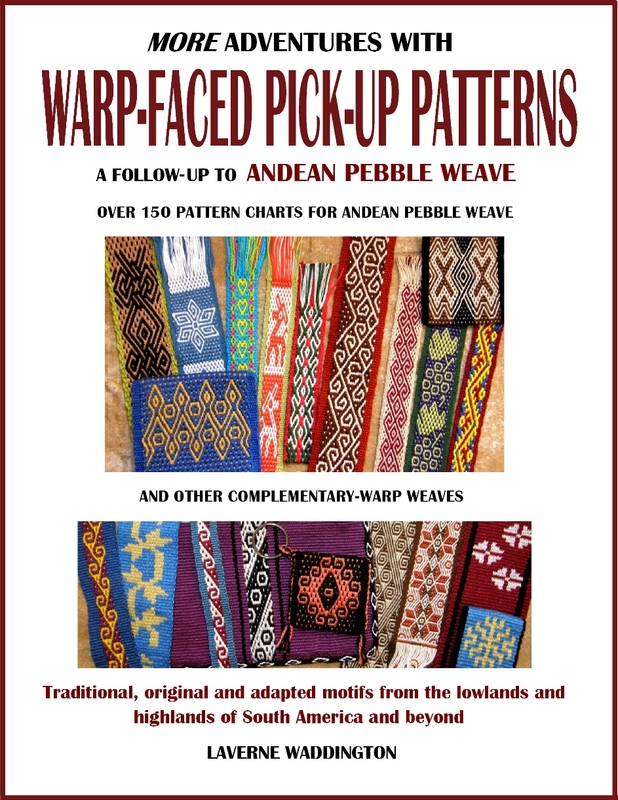 It is aimed at people with a serious interest in traditional hand-woven textiles from Asia, especially those from Eastern Indonesia.It will initially cover the foundation subjects, such as fibres, natural dyes, production techniques and the origins and history of the Austronesian people. We will later add pages focusing on specific regions and islands. 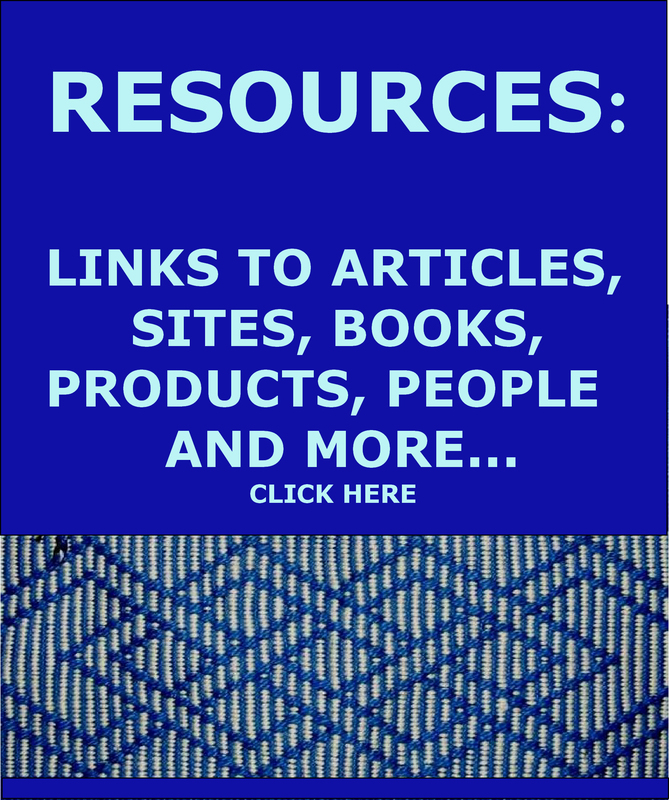 Please contact us if you would like to be notified when new material is added. The website already contains pages and pages of detailed information on natural dye sources and techniques as well as weaving techniques of various regions of Indonesia, all accompanied by stunning photographs. You can get happily lost in that site for days and will find yourself returning again and again. Threads of Life: Threads of Life is a fair trade business that works with culture and conservation to alleviate poverty in rural Indonesia. The heirloom-quality textiles and baskets we commission are made with local materials and natural dyes to an exquisite standard usually only seen in museums. We work directly with over 1,000 women on 11 islands across Indonesia, helping weavers to form independent cooperatives, to recover the skills of their ancestors, to manage their resources sustainably, and to express their culture identity while building their financial security. Threads of Life recently started offering workshops in batik, natural dyeing and weaving. You can find their 2018 schedule on the website. Sign up for their newsletter. Elinor finished an Andean Pebble Weave belt for her husband using a pattern from my second book. I am saving the cuff projects of our Ravelry Weave-Along-ers for next time. Now it’s back to the charting paper and the warping board and some more head-spinning Paisley patterns. Incredible work, Ms. Waddington. It’s always wonderful to see what wonderful things you are creating! I enjoy seeing your original ideas. I look forward to the finished result of your paisley project. The blue and white silk scarf will have lovely drape and sheen. I also enjoy seeing a bit of variation in solid colors for handcrafted textiles. It gives an old world look to a new textile that strengthens our connection to weavers of the past and present, a type of heritage that makes me proud to share as a textile creator. That’s so nice of you, Ginny. I wouldn’t mind trying that. In the meantime, I want to save the rest of my 120/2s for a project on its own. I am pretty sure I can manage it on my backstrap loom in structures other than double weave. Double weave was not a good choice for trying it out! It was fine in a short double weave warp but I think that 110” of abrasion would be too much to ask. I totally missed the beginning of the cuff weave-along on Ravelry. When I finish my present projects I’ll have to do one on my own. I traveled quite a bit in January, so haven’t had much time for weaving, but had lots of bus hours for knitting socks! I think we will be weaving along during February too so please join us if you can, Marilyn.